The Eradicator has come to Earth, forcing Superman to leave his adopted home planet behind. While keeping the citizens of Metropolis safe, Superman also must find a way to keep his family safe. Will he have time to protect everyone and find a place to do battle? “Son of Superman: Part Five,” written by Peter S. Tomasi and Patrick Gleason, begins on the moon with Superman transporting his family (Lois Lane and his son Jon) in an oxygen-rich capsule. Knowing the dangerous implications of a fight between Superman and the Eradicator, their safety is of the utmost importance. After gathering intelligence, via surveillance, Superman learns of Batman’s secret Batcave, located on the moon (Batman conducted this surveillance on Batman in secret, in a sort of spiteful way, before the events of Superman #5). Unbeknownst to the Clark family, the Eradicator shows himself and the battle commences. 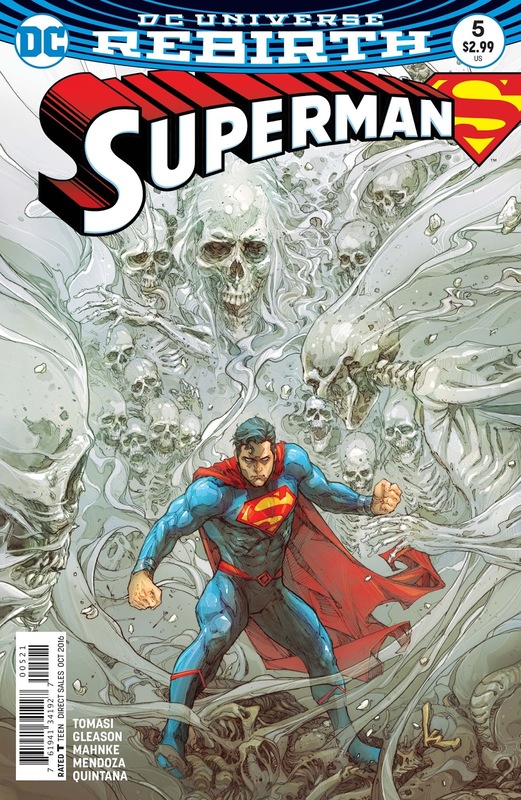 Superman has a plan to defeat the Eradicator, which includes entering the Eradicator’s ‘Phantom Zone.’ Our villain has the souls of Krypton living here; Superman needs to reach these souls in an effort to get them to help him battle and defeat the Eradicator. Meanwhile, the Eradicator focuses on destroying Jon. Lois comes into the fray when she discovers Batman’s infamous Hellbat Suit. 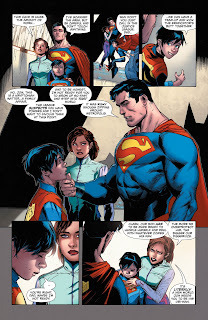 Lois and Jon do an exceptional job keeping the Eradicator at bay, as Superman returns from his negotiations. We believe the negotiations go well as Superman looks invigorated and has a plan to defeat the Eradicator as the issue ends. 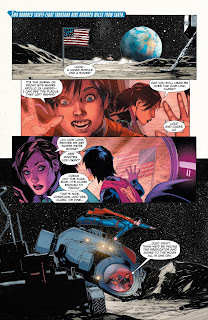 Tomasi and Gleason add another layer of depth by including Lois Lane. Batman has apparently created this secret lair in an effort to protect the citizens of Gotham from his dangerous experiments. Lois stumbles upon the Hellbat Suit during her encounter with the Eradicator. Reintroducing the Hellbat suit is a great touch, as fans know Tomasi and Gleason first introduced the Hellbat suit in Batman and Robin. Additionally, the Hellbat suit was forged in the sun by Superman, revamped by the Justice League, and permits Batman (or the person wearing it) to survive the harshest conditions. 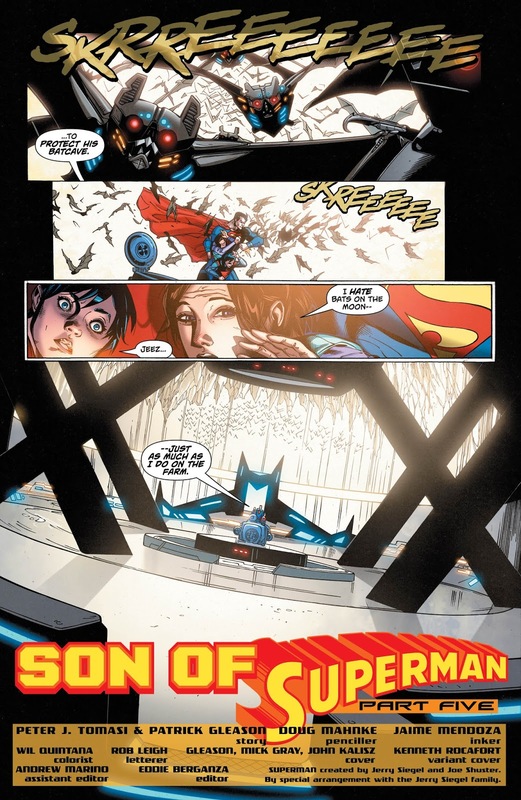 THE VERDICT: In the new DC Universe Rebirth, the new Superman seems as though he will consistently have villains attacking those closest to him, while pressuring him to decide between Krypton and the love for his family. The complexity of the Kent family bond is gracefully explored in this issue and is delivered smoothly. DC Comics proves, once again, that they have a specific plan for our traditional heroes that we all love and appreciate. 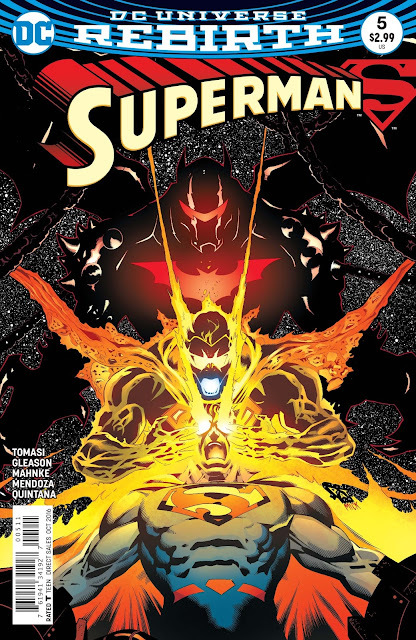 Including Tomasi and Gleason as writers on the Superman story-arc gives restoration to one of the most popular gadgets and story-arcs of Batman. Giving Lois Lane ownership of the Hellbat suit restores the character who has been overshadowed by Superman and her son. Fans of Superman should be excited; they’re in store for an excellent issue.